Over the weekend, I read a couple of the posts blogger Ana Mardoll has been writing in which she deconstructs some of the weirder/more objectionable elements of the Little House books. That sent me looking for an essay I'd read several years ago on the actual history of how the Osage people were removed from southeastern Kansas ... which is given a prominent, if rather warped, role in Little House on the Prairie. There were Kate Bender and two men, her brothers, in the family and their tavern was the only place for travelers to stop on the road south from Independence. People disappeared on that road. Leaving Independence and going south they were never heard of again. It was thought they were killed by Indians but no bodies were ever found. Then it was noticed that the Benders’ garden was always freshly plowed but never planted. People wondered. And then a man came from the east looking for his brother, who was missing. Laura Ingalls Wilder told this story in the context of explaining how the published stories about her childhood differed from the reality. She deliberately left out some things, she explained, because she wasn't trying to tell a 100% un-edited history. She was writing a children's book. Serial killers murdered by vigilantes doesn't make for great children's literature. Which makes sense ... except that there's no way Pa Ingalls could have been involved in the vigilante justice meted out on the Benders. As blogger and literature Ph.D. candidate Kate points out at the Condensery, the Benders weren't actually exposed until 1873. This was two years after the Ingalls family left Kansas. So why tell people that you left a story out of your memoir, when that story is not true? That's an interesting question, and I think it calls up some of the key issues involved with writing about your own past — especially your own childhood. How much do you actually remember about early childhood? Laura Ingalls Wilder would have been only 4 years old when she lived in Kansas. I do remember things that must have come from when I was around that age, but the memories I feel most comfortable calling real aren't particularly detailed. Or long. Instead, what I have are more like still pictures, rather than short movies—a fuzzy scene, a bit of emotion that scene created for me, and that's it. But there are other "memories", too. These are more centered around stories. The visual memories I have of them are definitely more like movies than snapshots. And, not coincidentally, these are also the memories that most coincide with stories I know my parents told me about myself. It's pretty well-established scientifically that our memories do not represent a 100% accurate portrayal of history. And that's not just in relation to childhood memories. Adult memories can be manipulated, too, and we can manipulate ourselves. An io9 story from back in January looks at a couple of different studies in the literature on this. Elizabeth Loftus, a psychology professor at the UC Irvine, has spent some time coordinating memories. She had experiment subjects come in and look at a little book of life events; three their own, one not. Each event was recounted to the researchers by the subject's relatives. The fourth event, being lost in a shopping mall, was created by the researchers. The relatives merely confirmed that that event had never happened to the subject. The false event has four parts: an extended period of being lost, crying, being helped by an elderly woman, and being found by a family member. Twenty-nine percent of the subjects remembered the made-up event. Twenty-five percent of them continued to remember the event after being outright told that it was made up, insisting that it happened. To me, the body of research on false memories suggests that Laura Ingalls Wilder might not have been lying when she told a story about her family crossing paths with the Bloody Benders. If you think about it, it would be pretty simple. A young Laura might simply have heard her parents talking about the Benders, misconstrued the situation, and created memories that fit her understanding. In the course of telling the story to friends and family, her parents might have changed it themselves — a simple "and it turned out they lived right down the road from us!" story became, over time, a story of participating in the downfall of the serial killers. However it happened, it happened. And it's completely reasonable to think that Laura honestly thought the story she told was completely true. Which brings up some questions: How accurate should we ever expect memoirs to be? Is a memoir supposed to be a personalized account of researched history, or a personal story of one's own (inherently inaccurate) memories? I don't know that I have a good answer for that. But I'm curious to hear what you think. 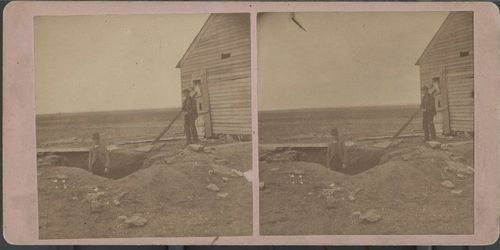 IMAGE: A stereoscopic photo showing the excavated grave of one of the Bender's victims. From the Kansas Memory site.